I never went to middle school. Where I lived, we attended elementary, junior and senior high schools. That meant grades 7-9 were together instead of 6-8. 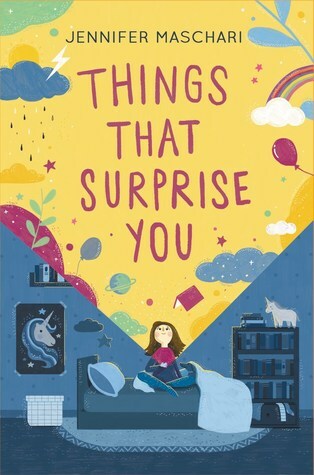 I’m not sure whether middle school or junior high is better, but Things That Surprise You, by Jennifer Maschari, certainly got me thinking about it. Things That Surprise You features Emily Murphy who is about to enter middle school. Emily and her best friend, Hazel, are the biggest Unicorn Chronicles fans, and Emily can’t wait for them to celebrate the series’ new book and movie. But things are changing, and they’re changing faster than Emily is prepared for. Hazel’s joined the field hockey team, and her tastes have evolved to match those of her teammates. Hazel starts wearing makeup and caring about clothes and boys. Suddenly Emily seems so babyish next to them. Home isn’t much better. Emily and her mom have started to adjust to just the two of them at home, but that won’t be for much longer. Emily’s sister, Mina, who has been in a treatment facility for anorexia, is expected to come home soon. Emily wants Mina come home, but she’s afraid Mina’s return will mean walking on eggshells again. It doesn’t seem to matter what Emily does. She no longer seems to fit anywhere. If only she could reinvent herself into the new Emily, the one everyone wants around. Reading about Emily and her experiences, I couldn’t help but think we push young people into growing up a little too fast. Would Mina have remained her friend one more year if sixth grade had still been in elementary school? But then, those changes are going to happen at some point, and maybe going to middle school helps with those transitions. There’s no real good answer, but I do have to say it triggered some self-reflection on my part. Any book that makes you think beyond it is good, and Things That Surprise You is excellent. In Emily, Jennifer Maschari has created a character that a lot of young people can see themselves in. Her balance of insecurity and an underlying sense of who Emily is at her core rings true. Emily is dealing with changes at school, changes with friends, with her sister’s illness, and with her parents who are recently divorced. Those themes provide multiple entry points for readers to engage. I wish there had been more books like Things That Surprise You around when I was a middle-grader. I would have gobbled them up.